Xcel Silver Vault System, 4 Piece - Norbert's Athletic Products, Inc.
Our Xcel Silver Vault System meets requirements of a 5'x5' vault system with 24", 32", 40" and 48" height settings. 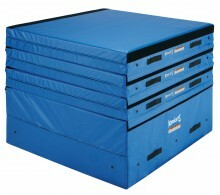 System consists of three 8" mats and one 24" pit, all sections constructed of durable solid vinyl with strategically placed grommets for optimal air expulsion. Permanently attached hook and loop connecter flaps for stacking and connecting height options. PLEASE NOTE: The 24" base pit has a higher density top foam section to provide the necessary support for vaulting. CLICK HERE FOR IMPORTANT SHIPPING INFORMATION! Click the button below to add the Xcel Silver Vault System, 4 Piece to your wish list.